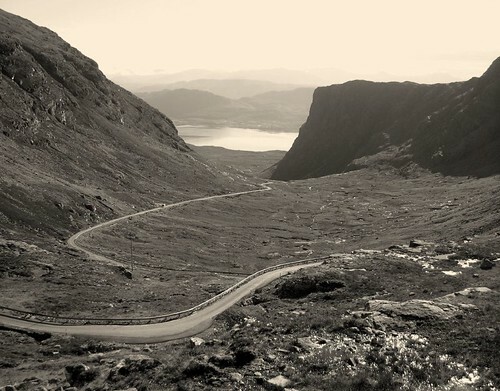 Another fine morning and I set off from the top of the pass of the Bealach na ba down from 2000ft to sea level. On the way down I could hear the stags rutting and bellowing through the glen. I watched some rock climbers and also paragilders high above the ridge. It was chilly when I set off but once I had descended a couple of thousand feet it felt pleasantly warm as I walked around Loch Kishorn. Kishorn was the site of a huge oil rig construction yard when Oil was first discovered in the north sea. Now it was just a storage depot for a company that made fish farm food. On the hill behind the little village of Achintraid, the huge double corries that sourround the winding road up the Bealach na Ba could be clearly seen and I knew I was making good progress although I was a little sad to be leaving Applecross as the last couple of days had been extremely enjoyable. I decided to follow a rough track on the map that would lead me over the hill to Reriag cottage. Although the path was muddy and badly rutted it was clear enough. That is until it entered a forest and I could not find the direction at all. I had my gps but I could not for the life of me manage to locate where the path entered the forest. I wandered up and down next to a fence and was stumbling over very wet land and getting thoroughly fed up. The trouble with a GPS is that you need a clear signal to pick up the satellite data and thats something you cant get in a forest. Finally I had a good squint at the map on my PDA and decided that the best option for me was to follow the Reraig burn through the trees where I knew it would eventually (i.e. 400 metres or so) lead to a forest trail. I had to hack my way through huge broken fir trees, and I had to cross over a ravine and wade through the stream itself because of the overhaning branches. After a bout 40 minutes I eventually clambered up and got back on to the path. I was hot and sweaty, wet from the stream and had was covered in scratches from the branches. I was also incredibly annoyed at myself for not locating the entrance into the forest. It also frightened me a little to think that I could easily have broken my leg in that forest and would have had no chance of getting out or even getting help as I had no signal on my phone and noone knew I was there. That was the most difficult section I have done on the three year walk and I only had myself to blame. Once I reached the turning point into Loch Torridon at Ardaneaskan I relaxed a little a enjoyed the stretch into Lochcarron although my feel were burning and I was struggling a bit at the end. That evening I treated myself to a pint at the hotel in Lochcarron and watched Scotland beat Italy at the Rugby World Cup. Every cloud etc…. This entry was posted on Saturday, September 29th, 2007 at 11:59 pm and is filed under life, photography, Scotland, trail, Travel, trek, walk. You can follow any responses to this entry through the RSS 2.0 feed. You can leave a response, or trackback from your own site.